What is Statistical Process Control - SPC? SPC is the use of statistical methods to determine the variation of a process or its outputs in order to maintain statistical control and improve the overall process capability. SPC utilizes a number of tools from control charts, trend charts as well as statistical metrics like Cp and Ppk. SPC is applied in manufacturing through the use of inspection and measurement data. This data is collected as both part and process measurements. Once collected, it is consolidated and analyzed to evaluate the quality performance of the manufacturing process and make determinations about future quality. This form of manufacturing visibility is important to both monitor the existing manufacturing process and make improvements for the ongoing process. For example, a system utilizing 30 part samples from a manufacturing line can set up Trend Charts to display the variation in the measurement over time of those samples. By monitoring these factors, the quality team can see if any parts are being built out of specification (non-conformance) or if the overall process itself is trending towards one of the specification limits, showing possible wear on machines, or instability in the process. Using this kind of Quality Intelligence gives manufacturers the time needed to resolve problems before bad parts are created, reducing scrap and downtime. Variation in manufacturing is assigned to one of two sources - Common or Special. This is a simple way of determining whether the variation is natural to the process, as in normal distribution of variation expected within the process. The variation quality professionals are looking for is Special Cause variation, which is caused by assignable sources of variation and can be removed through action. Common Cause Variation - The 'noise' in the process. This variation comes from normal sources and are present in standard processes. Special Cause Variation - These variation sources can be assigned to a cause other than the process itself. These unpredictable and uncommon (hopefully!) sources are the target for an SPC system to identify so that they may be resolved. The greatest issue most SPC systems deal with is time. Information about your processes only has value if it is received early enough to make changes to resolve the problem. Having to wait to analyze large amounts of data or hand off stacks of data to a specialist to pour through and crunch eliminates the primary value of having a system. This is why Real-Time analytics are so important. They get the information you need to the people who need it right when it is needed. QDM addresses this issue by calculating your metrics and reporting them as they are collected. The more data, and faster you can collect it, the faster you'll have your results. This keeps all stakeholders up to date minute by minute on the quality of production, and aware of any issues as they begin to trend towards out-of-spec situations. With instant updates, quality teams to jump into action before bad parts are produced and keep the line from shutting down at all, saving millions of dollars. The company-wide implementation of global measurement data at Jaguar Land Rover demonstrates how closed loop manufacturing processes can improve product quality. Headquartered in the United Kingdom, Jaguar Land Rover is a global automotive manufacturer that produces over 600,000 vehicles each year and employs more than 40,000 people. The brand is utilizing a SPC system to collect, analyze and act upon production data to enhance its dimensional variation analysis (DVA) operations. Jaguar Land Rover continually pursues opportunities and new initiatives to continually improve their vehicles and production. The company's DVA team sought a solution to improve quality across all of its product families. To determine the initial design intent input, the Jaguar Land Rover DVA Team uses ISO standards and guidelines to establish variation levels. These variation values and attributes are developed during the design phase to recognize specific requirements and the inherent dimensional capabilities of fabrication processes for each component. Their aim was to enhance their design execution by improving their Statistical Process Control (SPC) system to improve their feedback loops. The end goal was to implement a modelling strategy that maintained the principles of design intent while incorporating relevant data from their SPC system to enhance accuracy and ultimately improve vehicle quality and line rate speed and consistency. To advance their dimensional variation analysis capabilities, Jaguar Land Rover partnered with Dimensional Control Systems of Troy, Michigan, to implement a web-based Quality Data Management (QDM) SPC system. Offering various modules for customization, the purpose of this system is to collect, standardize and analyze measurement data to deliver actionable insights that improve production quality. This SPC solution features a centralized database and enables global access for Jaguar Land Rover. With multiple output formats and customizable reports, the QDM SPC system accommodates a wide range of demands from different stakeholders within the organization from shop floor to top management. The QDM SPC system enhances the DVA Team's ability to optimize CAD design by integrating real-world measurement data. 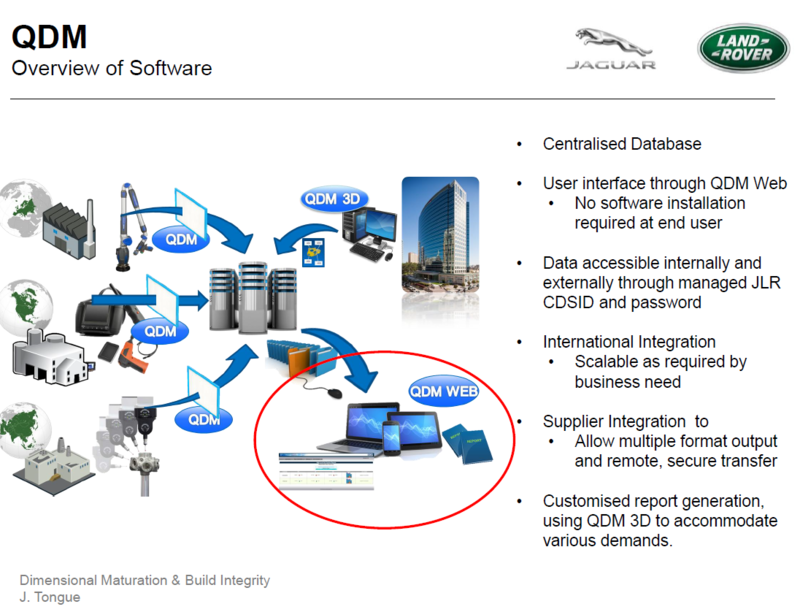 Jaguar Land Rover's design intents are created in a CAD environment, whereas the QDM system measures data in the manufacturing environment. The design intent determines the process specifications, while the SPC system evaluates the actual process capability. Detailed data from the end of the manufacturing process can now be evaluated in proper context and utilized to refine the design requirements. Jaguar Land Rover's process first assesses the CAD analysis results from their CAD simulation tools. Next, the SPC system analyzes the data it has received from actual measurements taken during the assembly process. The results from the CAD simulation and a SPC system are then correlated to determine whether significant variance exists. Jaguar Land Rover has set a tolerance of +/-10 percent to monitor for notable variation. When a significant variation is detected, the SPC data is aligned with the CAD model to identify the source of the discrepancies. 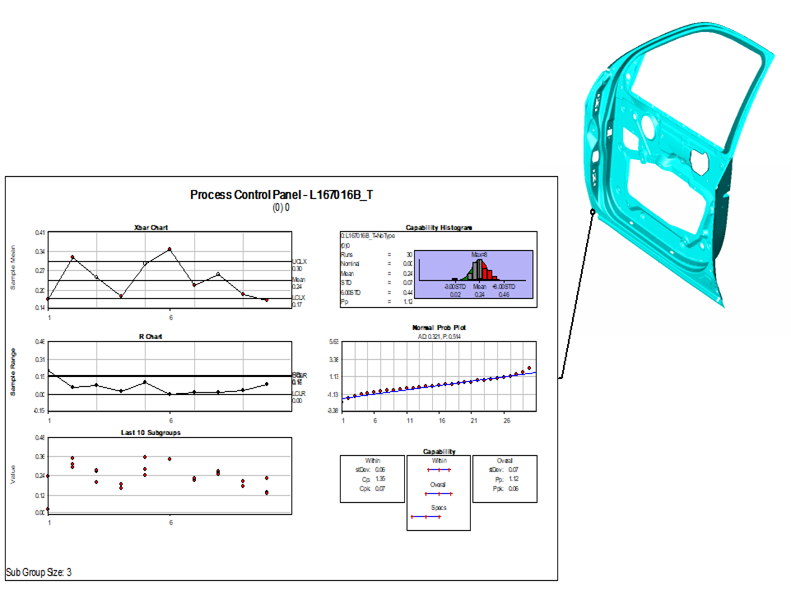 These data comparisons are used to derive an optimum body accuracy model, and the feedback from this process is incorporated to improve the design requirements. Implementing Dimensional Control Systems' QDM SPC system is assisting the DVA Team with distinguishing significant variations from "noise." In the manufacturing environment, there are many potential influences that contribute to process variations. The root cause analysis capabilities in the SPC system enable Jaguar Land Rover to differentiate between factors that would be beneficial to incorporate into their design models and those that should be excluded. Integrating relevant data from real-world performance improves the models' abilities to reflect the actual vehicles. End users report increased data accessibility since implementing the SPC system. Data from across Jaguar Land Rover's facilities and suppliers is now available within a single web platform. Engineers are using the customizable reports to track metrics on specific components and analyze performance over time. Like most manufacturers, Jaguar Land Rover has dimensional requirements. Their closed loop manufacturing process provides far greater insight into their production capabilities, which help to drive future standards and goals. By continuously collecting, analyzing, contextualizing and acting upon production data, Jaguar Land Rover is improving their design models. Producing more robust designs enables the manufacturer to draft better specifications and account for the real conditions in their assembly process. Ultimately, this leads to more efficient processes that produce higher quality vehicles that are easier to manufacture. Implementing a closed loop manufacturing process requires carefully considering design requirements, establishing a detailed measurement plan and deploying the new process with support from appropriate software tools. With the right measurements, processes and tools, a manufacturer's systems can continuously gather and analyze production data on key variables. Fit-for-purpose software tools facilitate building real-time feedback loops. Choosing a customizable system, designed for manufacturing enables companies to collect, analyze and utilize data more efficiently, while improving comprehension and communication across the organization. While software is important, outputs are only as reliable as the inputs that they are derived from, so implementing a well-designed measurement plan is essential. Both the processes and measurement plans should continue to evolve as new data provides insights into actual performance. An efficient closed loop manufacturing process enables quick decision-making and rapid response to virtually any quality issue. Embracing a digital thread allows manufacturers to run more adaptable and flexible workflows that prioritize quality control. Investing in intelligence-backed processes generates continuous improvements that increase productivity and ultimately create better products.